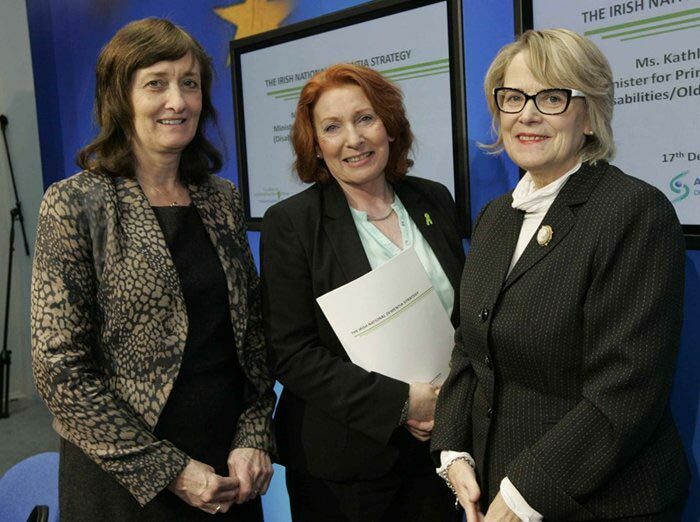 L-R Mary Sutton, Atlantic Philanthropies, Minister Kathleen Lynch and Helen Rochford Brennan, Chair of the Irish Dementia Working Group, at the launch of the National Dementia Strategy on 17 December 2014. The National Dementia Strategy (NDS) sets out a framework for the development of dementia supports and services in Ireland. Grouped under 6 action areas: Better Awareness and Understanding; Timely Diagnosis and Intervention; Integrated services, Supports and care for people with dementia and their carers; Training and Education; Research and Information Systems; and Leadership. €12.5 million investment by Atlantic Philanthropies in 2014, matched by €15million from the Department of Health and the Health Service Executive. The HSE’s National Dementia Office provides leadership for the delivery of the NDS. The Strategy Implementation and Monitoring Group is chaired by the Department of Health. The Alzheimer Society of Ireland is represented on the group by CEO Pat McLoughlin, member of our Irish Dementia Working Group (IDWG) Helen Rochford-Brennan and member of the Dementia Carers Campaign Network (DCCN) Sean Donal O’Shea. This monitoring group meets three times each year. A mid-term review, which was prepared by the National Dementia Office (NDO) and the Department of Health, was published in May 2018. The report acknowledges that significant challenges remain in ensuring that people with dementia and their carers get the support they need to live as well as possible. The Report also acknowledges that a significant increase in the amount of funding is now required to provide the supports and services. The ASI strongly supports this view. The Alzheimer Society of Ireland with the National Dementia Office mapped the dementia specific services available across Ireland and found a number of gaps in the availability and provision of appropriate dementia-specific community services and supports. This mapping report highlighted a lack of supports and interventions for people earlier in the dementia journey, particularly in relation to post-diagnostic supports such as Dementia Advisers, dementia counselling, dementia cognitive therapies, dementia information and signposting services/resources and support groups for people with dementia. The Alzheimer Society of Ireland began rolling out the position of Dementia Advisers in 2015 in response to a need identified in the National Dementia Strategy (NDS), and they currently number eight across eleven counties. The ASI has repeatedly called for funding to increase this number. ‘Evaluation of The Alzheimer Society of Ireland Dementia Adviser Service Report’, was commissioned by the HSE’s National Dementia Office (NDO) as part of the implementation of the National Dementia Strategy and finally published in October 2018. In the Report, people with dementia, carers, families, health and social care professionals and Dementia Advisers (DA) themselves recommended an increase in the number of DAs to meet the increasing demand, as a result of the increasing prevalence of dementia. The report recommends development of the service to achieve national coverage. The Understand Together campaign, funded under the National Dementia Strategy, was launched in October 2016 and run by the HSE in partnership with the Alzheimer Society of Ireland and Genio. The National Dementia Office has created several steering groups and working groups to work on the development of dementia services and supports. Alzheimer Society of Ireland representatives, including advocates from both the Irish Dementia Working Groups and the Dementia Carers Campaign Networks, participate in several working groups and steering groups including on diagnosis, post-diagnosis, younger onset dementia, psychotropic drugs, registry project, memory resource rooms.